Last year, we focused on what our members value most from their membership: resources; professional development; networking opportunities; and advocacy. 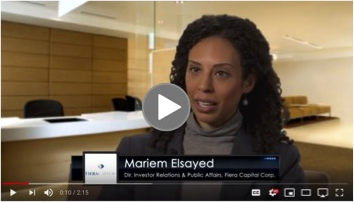 Hear how Mariem Elsayed, the Director of Investor Relations & Public Affairs at Fiera Capital Corporation, makes the most of her CIRI membership by leveraging networking opportunities to build and strengthen relationships. As we look back and take stock of what we accomplished in 2018, we'd like to recognize the CIRI team and volunteers for their contributions. As always, CIRI remains committed to creating the resources, professional development and networking opportunities that you need to excel in your investor relations career. In addition, we are keeping you apprised of regulatory issues affecting the field of IR and proactively advocating on your behalf to effect change. In the fourth quarter, we focused on delivering high-quality professional development, hosting 16 events across Canada. Hosted six National events across Canada. Click here for a glimpse of everything we provided in 2018. In 2019, we have some exciting plans to better facilitate member engagement and improve the accessibility of the many resources CIRI provides. Not a member? Click here to join CIRI today! The stakes for having the right people around the boardroom table have never been higher. Directors need to have the skills and experiences that not only align with their company's long-term strategic direction but also enable their boards to effectively advise management amid unprecedented change and business disruption. IFRS 16 Leases becomes effective for annual reporting periods beginning on, or after, January 1, 2019. Consequently, entities with a December 31 year end, who did not adopt the new standards early, will report financial results utilizing IFRS 16 for the first time in their March 2019 quarterly financial statements. Today the Ontario Securities Commission (OSC) published OSC Staff Notice 11-784: Burden Reduction, which outlines plans to broadly consult Ontario market participants on ways to further reduce regulatory burden and improve the investor experience. BlackRock survey shows continued shift away from equities and into illiquid assets. In September 2018, the U.S. Securities and Exchange Commission ("SEC") charged Elon Musk, the former Chairman of Tesla, Inc., with securities fraud. A series of Tweets on Musk's personal page, the first of which read: "Am considering taking Tesla private at $420. Funding secured", caused share prices to instantly soar. In reality, the potential transaction was uncertain and subject to a number of contingencies. Market confusion and disruption ensued. The Bill for the Buffet: Mifid II in the U.S.
A look at Mifid II in the U.S. a year after Europe-wide implementation. Board diversity, corporate culture, and sexual harassment will be among the key discussion topics for corporate directors next year.